My 9-year-old son, Orion, and I are often met with curiosity as people wonder why he’s not in school. “Actually, I’m home-schooled,” he responds confidently. The follow-up questions are usually some version of “Why?” Once, as I pushed him on the toddler swing, a nanny whispered, “Being with you is the best place for him.” I nodded, feeling vindicated, less like an extraterrestrial. During home-school preschool back when we lived in New York, my son learned to read and spell at age 2. It was a hands-on fluke as much as it was a product of technology. He discovered how to communicate with Dad by texting letters and emojis. We laughed and played in the spirit that every moment is a teaching moment. We’d count the squares in the pavement, decipher each bus sign and transit map to learn the alphabet, numbers and systems. His grandpa recounts subway passengers shocked at a 3-year-old boy’s ability to read ads. I started school when I was five, and I wanted the same for Orion. But these days, because of modern economic pressures, it’s rarer. I stressed myself out deciding whether to send him to kindergarten. I had him take the Gifted & Talented exam, even though he was only four. It seemed cruel, but the administrator assured me he’d be given time to play in between test questions. Some of the top gifted schools were known at the time for rigor. Passing said exam gave you access to more school choice. We were not interested in rigor for kindergarten but more choice is always a good thing. I knew he’d ace the exam and also be the last kid to finish. I was correct. He’d played with blocks in between questions. In his world, play and learning were synonymous. “That was fun!” he declared. Confident in his ability to learn, we contemplated sending him to kindergarten for “socialization,” which I’ve since learned is a key word used by schoolers to advocate for their choice in traditional education. A city kid with plenty of neighbors, Orion didn’t have a problem with “socialization.” Still, my husband and I felt kindergarten was worthwhile, and after much deliberation decided to send Orion to a school where I knew there was a focus on critical thinking and free play. I was secretly terrified that it could go wrong — that someone would try to squash his vibrant personality or worse, that he’d lose his love of learning. That it would become regimented, something that you do from 8 a.m. to 3 p.m. and not in every moment. One day during homework, my fear manifested. His mind went to solve a math problem with negative integers. “Great, let’s explore that! What happens if you subtract 100 from 50?” I asked. I reassured him, wiped his tears and wrote a note on the homework along the lines of: We have decided to explore this math problem with negative integers. We are going to follow our instincts. I assured Orion that it’s OK to experiment with math. We completed the school year, but I decided to home-school again. I want for my home-schooler and all children to develop and maintain a zest for learning, to light up at a challenge, to explore and discover through pure curiosity and to know no limits to what, when, how and from whom you can learn. Thinking should be fun, come naturally and without fear. When my husband got a new job, we moved to Seattle. Our classroom is a city rich with resources. We learn decimals by tallying up the bill in local coffee shops. We enjoy home-school days at the Woodland Park Zoo and the Seattle Children’s Theatre. We learn STEM at the Gates Foundation and the Pacific Science Center. We use the Seattle Public Library’s Museum Pass for access to a myriad of cultural institutions. We do jujitsu and bike to the playground for recess. Imani Razat on Twitter: @imanirazat. 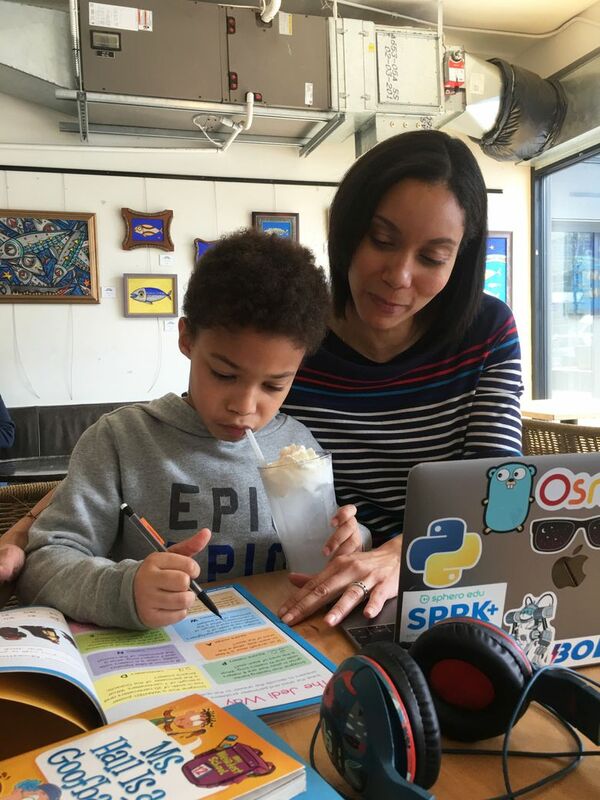 Imani is a Seattle-based (by way of New York) homeschooling mom who strongly believes that children should have some input on their education and preferred learning style. She has a background in magazine journalism, art and design.